The difference between indoor and outdoor basketballs is huge. While indoor basketballs are built to be consistent and soft, the ones made for outdoors playing focus on durability. 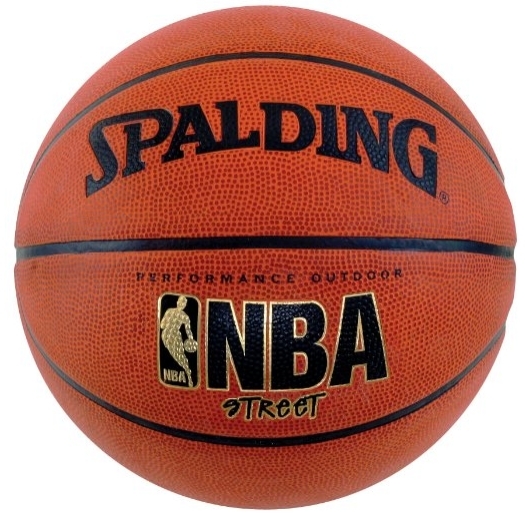 In this category, a Spalding NBA Street Basketball stands out and serves as a standard for all comparisons. We thoroughly tested this ball in order to see why it has been a fan favorite over the years. And with a 4.5-star user rating, there is no doubt that this is one of the most popular outdoor basketballs in the market. The first thing that comes to mind while holding this ball is the grip. This model features an ultra-durable rubber cover that serves a dual purpose. First, it’s made to withstand the extreme wear and tear that outdoor courts inflict on the ball. And second, the rubber serves as a really good surface to ensure an optimal grip. This ball has a great overall control and good handling abilities. The only issue we found with it is that when it gets dirty, you lose a lot of that grip. The channels are wide and make sure that you retain good control over the release. A very dense pebble design handles the moist well and you should not have any issues is your hands have a bit sweat on them. The usual complaint about the outdoor basketballs is inconsistency in the way the ball bounces. We tested this model in various conditions and found no major differences in the results. As far as outdoor basketballs go, this one satisfies all the criteria needed to have a quality game. A big factor with basketball of this type is the amount of air inside. If you find any inconsistencies, try playing around a bit and inflate/deflate it to gain better results. The valve is easily accessible and the process takes less than a minute. As mentioned above, this ball stacks pretty well against the competition, or should we better say, competition is being compared to it. You can find more balls for street play by checking our reviews. This model is used as an industry standard and even the other manufacturers recognize that. The players we talked to for the purpose of this review stated that if there are multiple balls on the court, this one is the choice for a game more often than not. That should serve as a sufficient recommendation. Overall, this ball will certainly serve you well, perhaps for a couple of years if you take care of it, and it offers an excellent ratio of price and value. With competitive pricing, Spalding NBA Street basketball will certainly be a good choice. Furthermore, 2000+ happy users who gave high rating(4.2 out of 5) and status of best selling ball in the market speaks louder than words and all the reviews.